If you’re looking for DIY horse barn organization and DIY tack room ideas, you’ve come to the right place! Drowning in a sea of blankets and saddle pads is a common problem for horse owners, and it often seems there is an unspoken rule to collect the most tack possible. I will neither confirm nor deny this, but I do have to admit that my barn is overflowing with every imaginable piece of equipment. Do I really need 15 bits for a horse that always goes in a plain snaffle? Maybe not. But at least if I can organize it so they don’t look like a giant web of metal I can get away with it. For now. Here are my favorite tips to help you show off organize your collection. Why didn’t I think of this? Used cabinets are easy to find at garage sales and thrift stores for very little money (or find a business doing a renovation). The full tutorial can be found here. I love that it can hold so many shovels, rakes and forks. The perfect way to organize an unruly hose. These are a great multi-purpose organizer for anything from wraps to whips. I use mine to store shipping gear (boots, poll protectors, break-away halters etc.) so I’m not scrambling at the last minute to find everything (while a trailer full of horses is waiting). These bins dropped into a wood frame are perfect for grain storage. 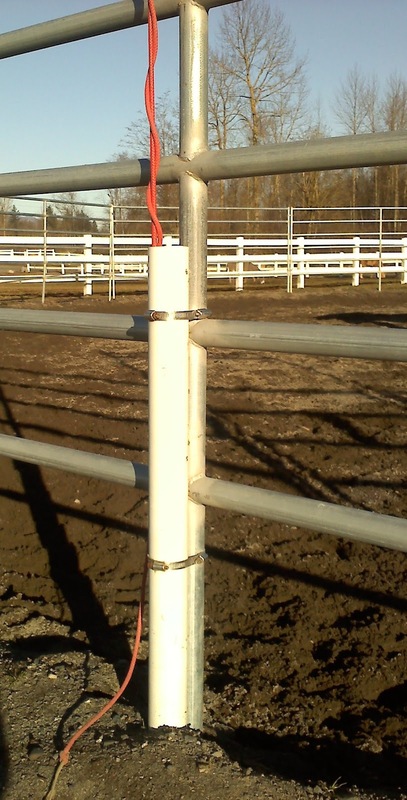 Secure a piece of PVC pipe to the fence with hose clamps and you’ve got a convenient place to keep your whips. I have two sizes at home; one for lunge whips and one for crops. Now I have one less thing to lose on the way back to the barn! This is a quick project that uses scrap lumber and can be put together for about $5. Complete directions can be found here. I put eye hooks all over the tack room so they can be easily moved around and can accommodate different saddle sizes. Genius! For less than $10 you can create this practical and cute wall of boots. Savvy Tip – I recommend using a solid wall, not a door (as pictured). I tried the door and my older, worn boots fell off when it closed too hard. These industrial Velcro strips work great for this. This DIY project is surprisingly simple. The instructions and list of supplies are here. It’s so much better than multiple trips to the tack room, and great for shows or travelling. If you live in an area that requires year round blanketing (snow/rain/flies) then this is a huge space saver. Once blankets are clean and dry, just store them in large containers. Don’t forget to label them with the horse’s name and type of blanket (or the size) to make finding them a piece of cake. This is a huge space saver. You can keep blankets and saddle pads stored this way so they’re always dry and ready to go, and makes it easier to rotate through your collection too. What’s your favorite DIY horse barn organization tips and DIY tack room ideas? I absolutely love your hose bucket station idea. You can store all your cleaning supplies while having easy access to your hose. No more hose kinks either!